Wild raspberries are common plants in forets on moderately fertile and fertile soils, on powerline clearings, road verges, shores and in forest felling areas until the new trees overgrow the raspberry plants - they need plenty of light. 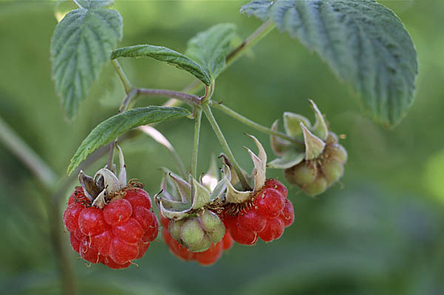 The raspberry is classified as a bush because of its lignified stems although the plant is only biennial: in the first year the stem only produces leaves, that are greener on the upper side, paler on the underside and sparsely hairy. In the second year the lignified stem carries flowers and just now, berries that ripen unevenly. Thus it is possible to pick berries several times from one stem. As the fruits ripen the stem dies but from the underground rhizome a new stem has already grown up. Botanically the fruits of the raspberry are not berries but aggregates of drupes, that is, the "berry“ consists of small grain-like drupes, several tens in one fruit. Sometimes the fruits are “maggoty“; a well-fed larva is busy in the fruit. It is the larva of an insect: the raspberries are damaged by the larvae of the raspberry beetle (Byturus tomentosus). The larvae disappear in August, going into the soil to form pupae. Later in autumn beetles appear and winter in the soil. In June next year the beetles lay eggs on the raspberries – and this is the life cycle of the raspberry beetle.